At our manufacturing facility in Liverpool, we have whole department that is responsible for the design and assembly of new cable drums, as well as the collection and refurbishment of old drums for reuse – we call it the Drum Shop. Paul Lay, who this year is celebrating his 18thyear with Prysmian, is currently the Drum Shop Planner and Team Leader. 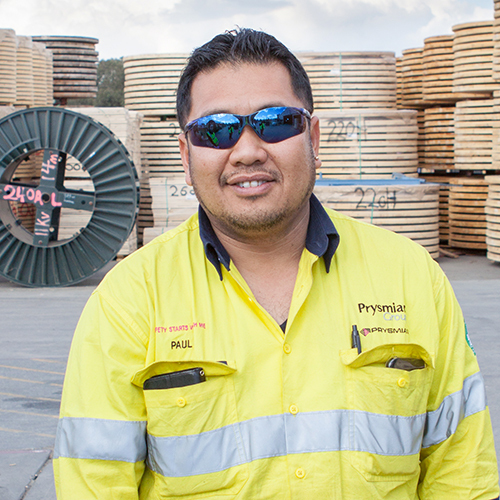 Paul’s journey with Prysmian began in 2000, when he was taken on as a Machine Operator in the Despatch area. After being in that position for around 6 years, his potential as a leader was recognised and he was offered a Team Leader role. “Working with Prysmian can come with its challenges, but at the same time if you work hard and show that you’re keen to learn, it can give you a lot of opportunities.” Over the years the company has also helped Paul to obtain and keep his Fork Lift license and First Aid up to date, as well as complete his Certificates 3 and 4 in Competitive Manufacturing. “Obviously our biggest nightmare would be not having any drums…with the increased production output over last few years, our team has grown in numbers and as a result of this we have learned to be more proactive and efficient” Paul said. He then went on to explain that not long ago they were making the drums as the orders came in, but now they are made in advance, to ensure that there is plenty of stock even during busy months. We’d like to express our appreciation to Paul for his effort and commitment to Prysmian and his team. From the deepest oceans and mines to the highest up satellites orbiting Earth, you will find products made by us. Prysmian Australia supplies cables and tailor-made solutions within power distribution and transmission, telecommunication, construction and several industry markets such as mining, oil and gas and renewable energy sources, off and onshore.